Should I Focus on the SAT or ACT? High Schools throughout the United States tend to pick sides as to whether the SAT or ACT is the more prevalent test. Because of this, students will often focus on the test they believe to matter most. However, most colleges accept both scores without favoring one test over the other. Taking both tests at least once will give you a fair advantage in understanding which test is best for you and the way that you think! 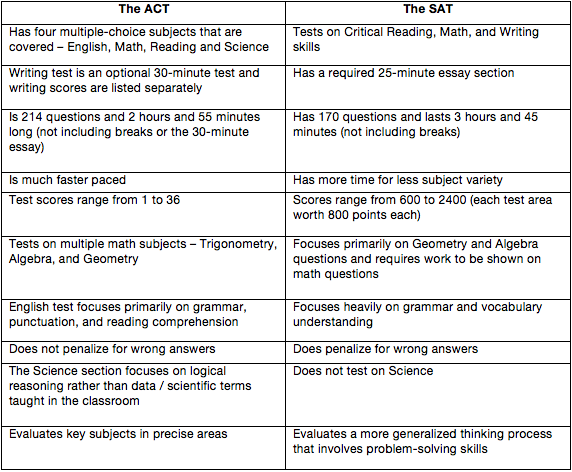 One way to determine whether the ACT or SAT will be the best for you is to learn more about their differences. Overall, you’ll find that the ACT questions are more straightforward and the SAT has a style of tricky questions to induce logic-oriented reasoning. This makes the SAT the more teachable of the two tests. The ACT is considered to be an intuitive test to measure a student’s critical thinking ability while the SAT is more generalized. Many students shy away from the ACT, considering it to be a much harder test because of its inclusion of multiple math areas and science. Other students, who are not a fan of English, consider the ACT to be the easier of the two tests and shy away from the vocabulary heavy SAT. Neither test is more popular. In 2013, both the ACT and the SAT had over 1.66 million students take the test at least once during the school year. Things to consider: Send in your very best score when applying for college and both ACT and SAT scores if you qualified in the 95th-99th percentile on both. Nearly every college will consider a variety of students via the SAT sub-scores (the 800 score for either Math, Critical Reading, or Writing). This decision is based on a school’s reputation and the student’s desired major. One great feature of the SAT is that your very best score from each section collaborates to be your final score when you take the SAT more than once. So even if you do your best on Writing the first time you take the SAT and your best on Math the third time you take the SAT, these two scores will be added as the SAT score that will be submitted to schools upon your request. Likewise, very few colleges consider the sub-scores of the ACT. Whether or not a student decides to take the SAT or the ACT, SAT Preparation Group recommends that all students take an SAT or ACT practice test. 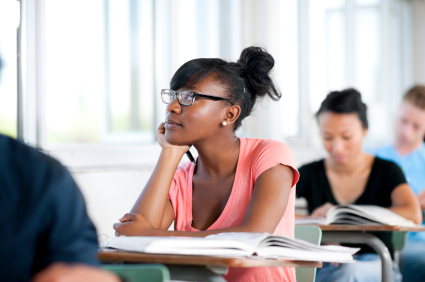 Upon receiving your score, SAT Prep Group will give each student a full evaluation of their strengths and weaknesses. This evaluation can be helpful in studying for both tests or deciding which test will be best for you. SAT Preparation Group recommends that if the college of your dreams accepts both the SAT and the ACT, consider taking both tests to see which test you score in a higher percentile. For sophomores studying for the standardized test of their choice, consider how the SAT and ACT are changing next year. Steve Kirshenbaum, M.S. is an Educational Consultant and Founder of SAT Preparation Group, which specializes in worldwide ACT / SAT coaching. SAT Preparation Group advises in test prep, college planning, and success strategies for teens.